Before anyone else in my household wakes, I pour a cup of coffee, open my Bible and journal, and settle into my favorite leather loveseat for quiet time with God. These precious moments set the tone for my entire day and the attitude with which I tackle my to-do list. They fill me with hope, give direction, and grant wisdom. Join me, dear reader, in this discipline of delight and let’s share spiritual aha moments at the start of each day. NOTE: This book was formerly titled 10-Minute Time Outs for Busy Women. It’s been reformatted and newly released as a gorgeous little gift book. It’s 4″x6″ with a padded hard cover and blue ribbon bookmark. It makes an ideal gift for birthdays, Christmas, secret sisters, anniversaries, and Mother’s Day. Give it as a thank-you gift to your pastor’s wife, a special teacher or youth worker, a missionary. Or give it to a special friend “just because.” Suitable for women from all walks of life—married or single, ages 19-90. Grace Fox understands the world of the busy woman and the reality of our need to be fed spiritually. 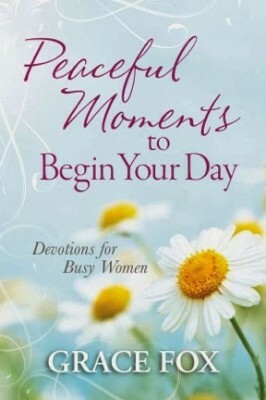 In her devotional book, Peaceful Moments to Begin Your Day, Grace follows an easy format that takes you into God’s word and gives you a truth to ponder for each day. Grace’s words paint pictures and tell stories that will remain with you and continue to feed you long past those peaceful moments with the Lord. You could be transformed and you could offer Peaceful Moments to the women in your world – creating a ripple effect!